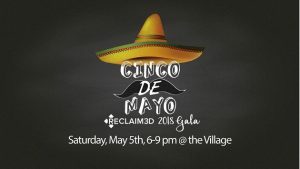 You’re Invited To The Cinco De Mayo Gala – a fun night to raise money for Reclaim3d, which exists to reclaim bad circumstances into something beautiful locally, regionally, and globally. The goal is to raise $20,000 for the missions below as well as needs within our community.  Janine Maxwell from Heart for Africa – Provides self-sustainable homes for orphans in Swaziland, Africa.  Destiny Rescue Rep – Provides hope and healing by rescuing girls from human trafficking in Cambodia and Thailand.  Ms. Pearl from Good News Daycare – Provides free Christ-centered daycare for children in the Roseland community, one of the toughest areas of Chicago. While the children are being well cared for and loved, the moms can get an education, work, and provide for their families. Delicious food, amazing auction items, 50/50 raffle, a whole lot of fun and it’s FREE!